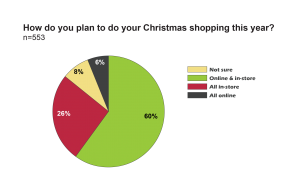 We conducted a poll study in October 2013 to explore the attitudes and intentions of Australian consumers about Christmas shopping for the upcoming holiday season. Respondents were polled through i-Link's own consumer research panel, LiveTribe, with a total sample size of n=553. The sample was drawn representatively to match the national distribution for age, gender and location in Australia. 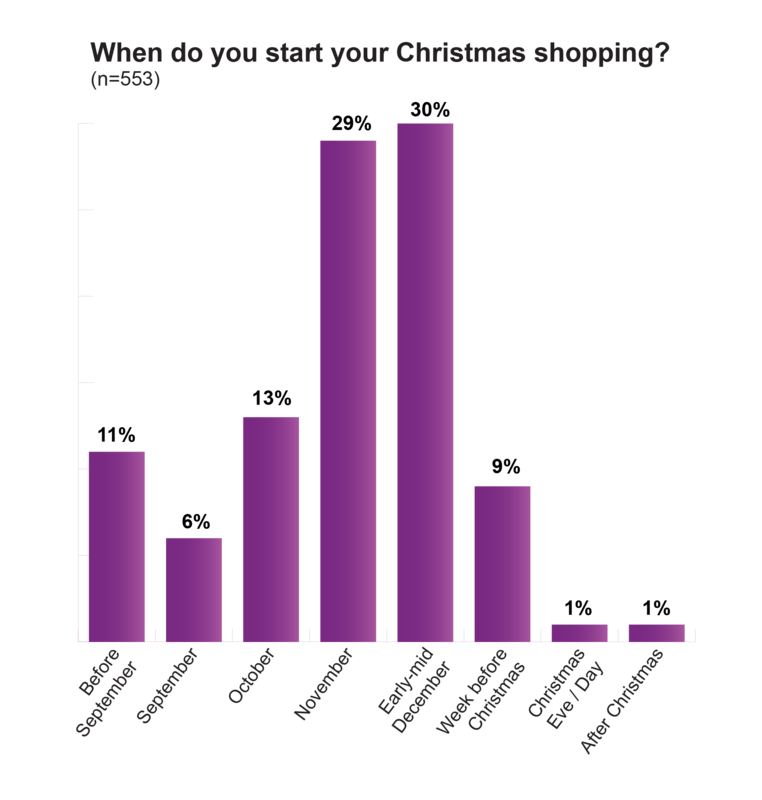 While a portion of respondents chose to get a head start by beginning their Christmas shopping in October or earlier, the majority said they will wait until November or December, keeping up the traditional Christmas rush that we are used to seeing this time of year. Respondents were divided when asked what they like and dislike most about shopping during the Christmas period. While the Christmas spirit seems to enhance the experience for some, for others it does nothing to make the crowds and busy stores more bearable. 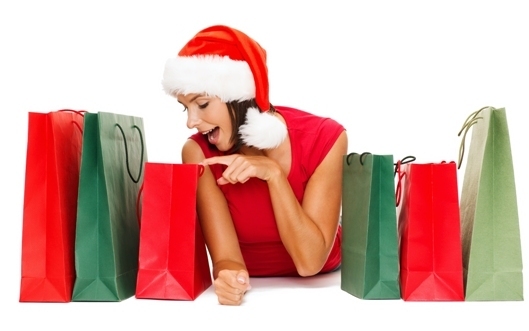 Shopping over Christmas made more enjoyable by factors unique to this time of year, such as an abundance of sales and special offers (16%), and the opportunity to shop for loved ones (8%). The atmosphere and feeling of festivity is what fourteen percent (14%) of respondents said they like most about Christmas shopping. Aesthetics in particular seem to contribute to making the shopping experience more pleasant, with nine percent (9%) of respondents citing Christmas lights, decorations and colours as the things they like most about shopping in the holiday season. 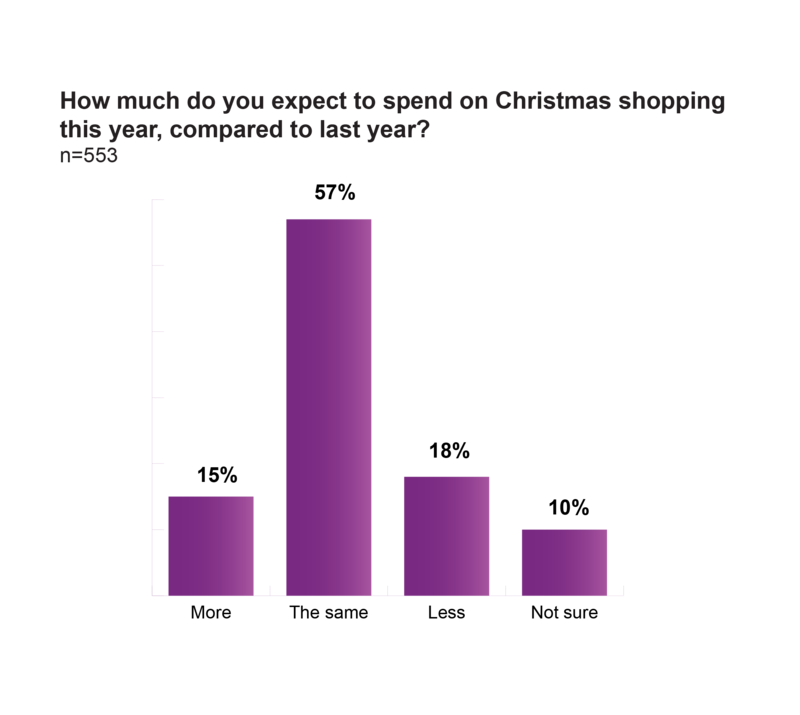 Where positive sentiment about Christmas shopping stems from the occasions or events that occur during this time. For example, Christmas parties (1%), and family gatherings (1%). In terms of dislikes, more than half of the respondents (54%) cited crowds as the thing they liked least about shopping during the holidays. Other pet peeves for shoppers at this time of year are the stressful atmosphere (12%), lack of parking (10%) and the overall cost incurred (8%). With the seemingly endless choices of products available for purchase, it's little wonder that just over half (54%) of respondents will be leaving the decision up to their gift recipients by them giving vouchers or giftcards as Christmas presents. Other popular gift product categories were clothes, shoes and fashion accessories (40%), and toys or games (38%). 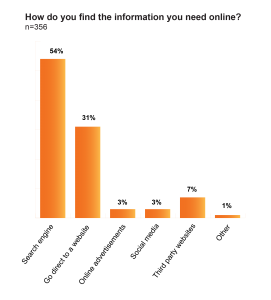 When looking for information to help them with their Christmas shopping, most respondents turn to the Internet (64%). Other popular sources of shopping information are print catalogues or store flyers (59%), and in-store displays (46%). 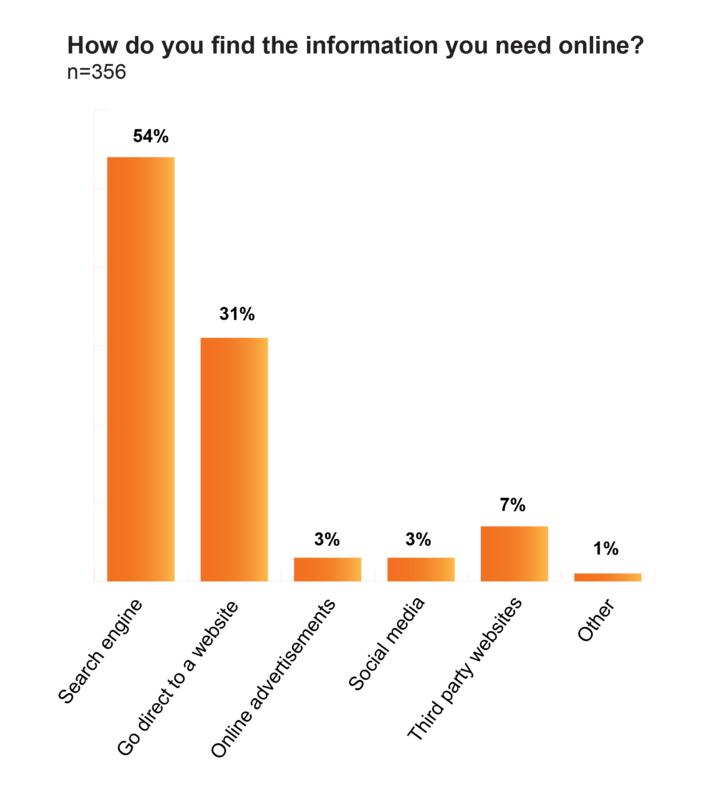 For those respondents who turn to the Internet for shopping help, the preference is to go straight to the source with around half (54%) saying they find the information they need by using a search engine, or going directly to a product, brand or retailer’s website (31%). Despite the availability of online shopping, about a quarter of respondents still plan to do all of their Christmas shopping in-store, while the majority (60%) will be combining the best of both worlds. In terms of spending outlook for this year’s holiday season, the majority of respondents expect to spend about the same amount on Christmas shopping this year as they did last year (57%).